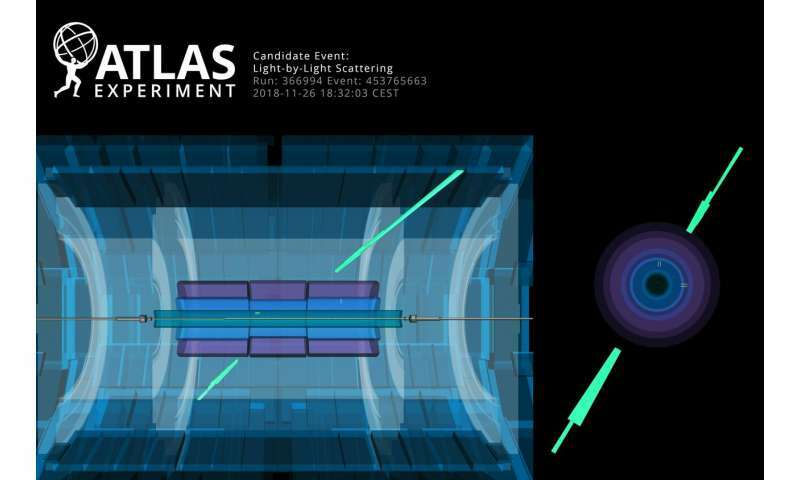 In a result published in Nature Physics in 2017, the ATLAS Experiment at CERN found thirteen candidate events for light-by-light scattering in lead-lead collision data recorded in 2015, for 2.6 events expected from background processes. The corresponding significance of this result was 4.4 standard deviations – making it the first direct evidence of high-energy light-by-light scattering. On 17 March 2019, at the Rencontres de Moriond conference (La Thuile, Italy), the ATLAS Experiment reported the observation of light-by-light scattering with a significance of 8.2 standard deviations. The result utilises data from the most recent heavy-ion run of the LHC, which took place in November 2018. About 3.6 times more events (1.73 nb−1) were collected compared to 2015. The increased dataset, in combination with improved analysis techniques, allowed the measurement of the scattering of light-by-light with greatly improved precision. A total of 59 candidate events were observed, for 12 events expected from background processes. From these numbers, the cross section of this process, restricted to the kinematic region considered in the analysis, was calculated as 78 ± 15 nb. Curiously, the signature of this process – two photons in an otherwise empty detector – is almost the opposite of the tremendously rich and complex events typically observed in high-energy collisions of two lead nuclei. Observing it required the development of improved trigger algorithms for fast online event selection, as well as a specifically-adjusted photon-identification algorithm using a neural network, as the studied photons have about ten times less energy than the lowest energetic photons usually measured with the ATLAS detector. Being able to record these events demonstrates the power and flexibility of the ATLAS detector and its event reconstruction, which was designed for very different event topologies.